Facebook has been having a tough time since their IPO as investors are taking them to court over the misrepresentation of future profitability of the site and now users are revolting over one of Facebook’s main methods of increasing their profits. Ouch. Once a company floats it struggles to keep to the ideals of its pre-IPO self. We saw this with Google, as a company that did “no evil” prior to IPO has since backed out of China, made deals over mobile net neutrality, and more – it’s not that they have gone evil by any means, just that they have become another faceless corporate giant. Now Facebook has floated, the place originally built as a way for college kids to socialise online is focused on profits rather than social – and that means making more money by selling more personal details to advertisers, and now squeezing their users for cash as well. 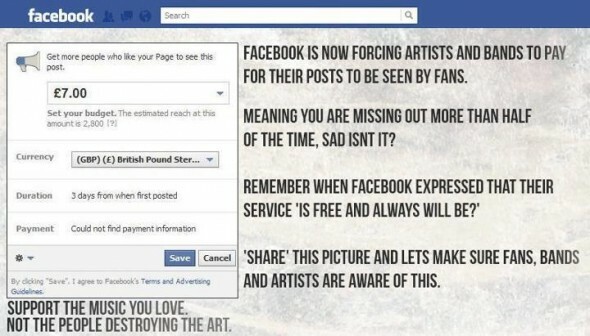 The current revolt is in response to Facebook wanting money in return for bands, artists, creators, celebrities, and everyone with a Facebook page to get their updates shown in their fans’ timelines. This isn’t asking for money for these page-owners to reach new fans (ie. advertising), no, this is squeezing page-owners for money to reach the fans that have already signed up to receive updates from them – a service that both the page-owners and the fans want, and a major reason they use Facebook. By offering “Pages”, Facebook essentially made itself a defacto news/RSS feed for those that don’t know or care what RSS is, but now they are skewing those feeds in a money grab against their users. What is worse is that they have not informed the fans that they are doing this, so unless a page-owner pays then the fans will simply stop seeing updates and could well miss the information they signed up to follow like tour dates, new releases, new products, or whatever it is that Page is offering. Facebook aren’t after a one-time fee for page-owners to reach their fans either, as you can see in the graphic above they are squeezing page-owners to pay for single messages to reach more of their own fans, essentially taking fans away from those who don’t pay up. The Facebook news feed has previously always been about users getting the updates they want from those they are most interested in – both friends and bands, organisations, companies and anyone else they have chosen to friend or like on the service. Facebook are now changing that without informing their userbase of nearly a billion people. Pre-IPO Facebook may have made plenty of mistakes, but it understood the different between communication people ask for and advertising. With Facebook struggling to demonstrate sufficient profits from the former, they are rather crudely and in an underhand manner trying to monetise the latter.